Having dined and traveled across different countries, it always amazes me how cooks arrange vegetable platters according to the season and their culture. In northern China, the vegetable platter is one of the most popular items when you enjoy a rustic meal. It can be a cold platter, containing sliced radishes, cucumber, yam, green onion, and cherry tomatoes, all served with hoisin sauce (or a more savory soy paste). In winter it’s a hot dish that contains steamed vegetables – corn on the cob, mini purple sweet potato, peanuts, pumpkin, and edamame. Most people enjoy the vegetables as they are for their fresh seasonal taste, or they can be lightly dusted with sugar. When traveling in Switzerland, I saw this beautiful crudité platter at a house party. 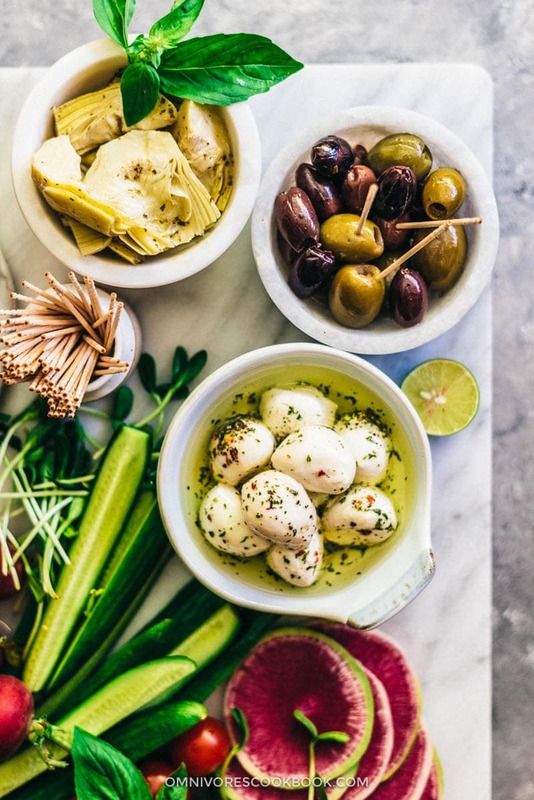 It was made with different mini skewers, such as olives and cucumber, or mozzarella balls with cherry tomatoes. Neatly arranged on a large white plate next to the cheese platter, it successfully won over all the guests due to its beautiful color and amazing taste. In Japan, chefs usually present the vegetable platter with crispy assorted tempura – various sliced vegetables coated with a very light and mild batter and deep-fried until crispy, served with a mild seafood-based sauce that is savory and sweet. Some of the classic items include eggplant, pumpkin, shishito peppers, sweet potato, and lotus root. 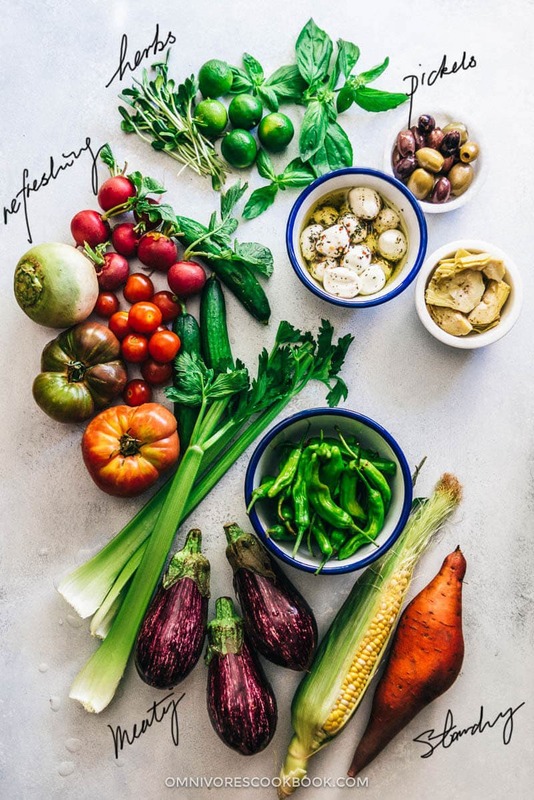 According to the philosophy of Japanese cuisine, deep-frying brings out the vegetables’ flavors, so you can truly taste their deliciousness without using many seasonings. I love to serve a big colorful crudité platter when I entertain guests for a gathering or at a grilling party. When I assemble my crudité platter, I use everything I’ve learned from different cultures, to make it more interesting than your usual carrot and celery sticks served with ranch dressing. This means you will spend less money on groceries and get the best-tasting vegetables. A produce seasonal chart might come in handy, but my favorite way is to go to a market and buy whatever looks good at the lowest price. 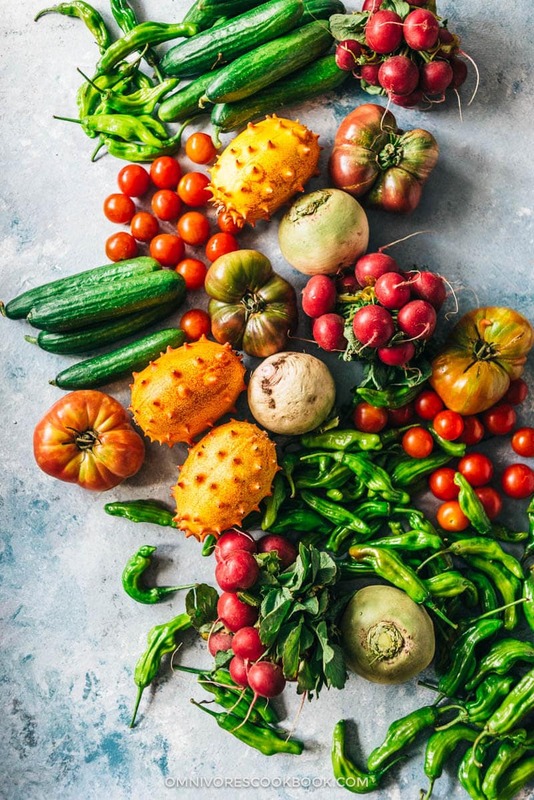 Especially if you live in the US, many markets are stocked with fresh and in-season vegetables imported from all over the world. I assort all the items into: refreshing, meaty/starchy, herbs, and pickles. Most vegetables that you plan to serve raw fall into this group. For example, the most commonly served are celery, carrots and cucumber sticks, and colorful veggies such as tomatoes and radishes. Simply choose 3 to 5 items from this group, and your platter is already looking colorful and pretty. This group contains vegetables that you’ll serve cooked, such as eggplant, potato, sweet potato, corn on the cob. Choose 2 to 3 items from this group and I guarantee your vegetables will be way more popular at your party. Not only can you use them to make a better dipping sauce, they are a beautiful garnish on your platter. I always pick some citrus, because some guests might want to squeeze some juice over the veggies and sprinkle on a bit of salt. It tastes so good! One type of herb and one type of citrus will be enough. Pickles and cheese don’t only belong to charcuterie and cheese boards! Add them to your crudité platter so your guests can pair them with fresh vegetables. Plus it goes great with any booze you’re serving. You can choose 2 to 3 pickles. I love pickled olives, artichoke, sun dried tomato, and cucumber. I always serve mozzarella cheese if tomato is on my platter. Tender and sweet veggies with charred surfaces and heavenly smokiness. Who doesn’t love that?! Simply coat the vegetables with olive oil and sprinkle with salt and pepper. Use this recipe as a general guide for grilling times. If you’re feeling fancy, skewer the veggies onto a stick and make vegetable kebabs. The most hands-off and easy way to clean up. 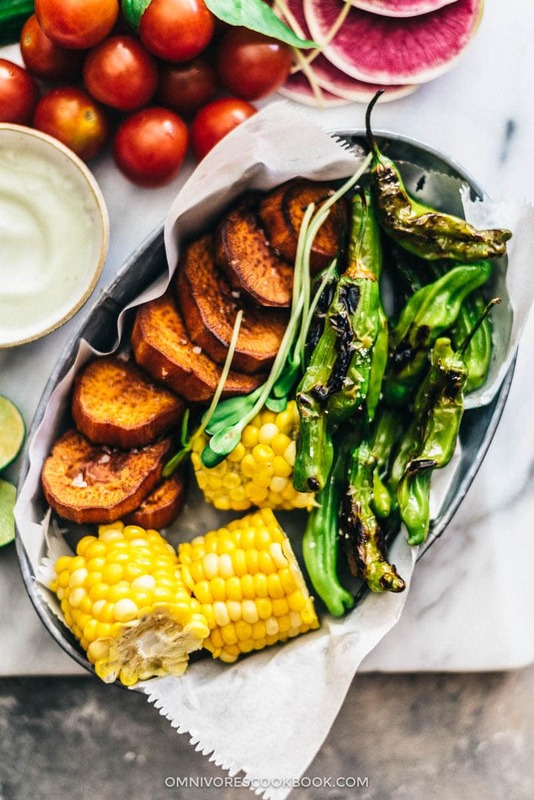 Here is a general guide of how to grill any vegetables. I found deep-frying is the best way to go if you plan to serve fried potato or fried sweet potato. I used to bake French fries in the oven, but I found it takes so much time to arrange and flip each potato stick. If you plan to fry a lot vegetables, you only need to heat up a batch of oil and use it to fry everything. I do not use a batter so it reduces the workload and keeps the frying oil clean. I always serve 2 to 3 dipping sauces – one savory, one sweet, and one spicy, because each vegetable goes well with a different type of sauce. Plus, it makes eating them more exciting and your guests can choose their favorite. Vegan Mayonnaise – I’ve been in love with this recipe lately because you only need 4 ingredients! It makes a great base for other sauces if you need to serve vegetarian food. Moreover, I strongly recommend to place a small plate of olive oil and sea salt on the side, to provide another healthy option for your guests. Choose a large platter – for example a marble platter, wooden tray, or a slate board will work well. Place the cooked vegetables in a big plate or a basket. Place it on a corner of the platter. If you cooked a lot of vegetables, you can use more plates to separate them. If you made any vegetable skewers, you can place them on a long plate on a corner of the platter. Arrange all the raw vegetables in the center, because they are the most colorful and the star of the platter. Place sauces and small bowls of pickles in between, to fill up the gaps. I hope you like my crudité platter! It might be different from the version you usually serve, and it does require a bit more time to prep and cook, but you’ll be really glad at how it looks and tastes. If you make a crudité platter using some of the tips in this guide, let us know! Leave a comment, rate it (once you’ve tried it), take a picture and tag it @omnivorescookbook on Instagram! I’d love to see what you come up with. Disclaimer: This is not a sponsored post. I received some of the fresh vegetables from Melissa’s Produce free of charge and used them in the photos in this post. 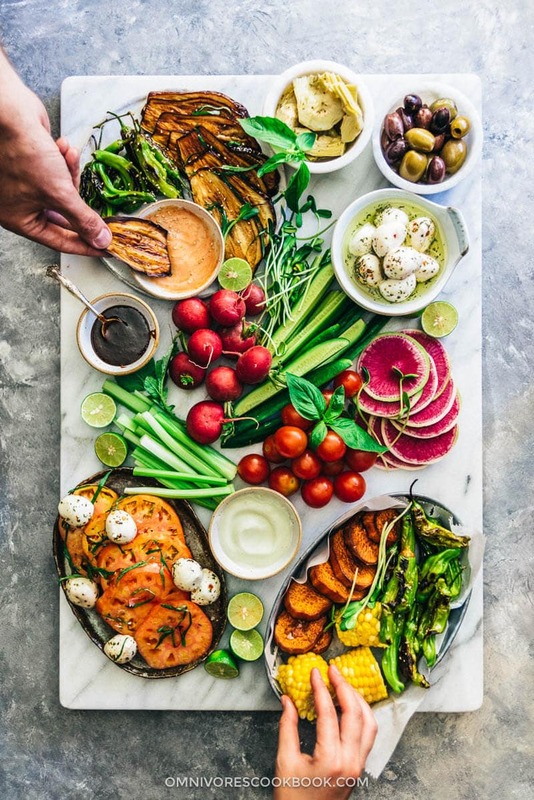 This recipe uses many types of vegetables to demonstrate how you can easily cook vegetables and make your crudité platter more interesting. 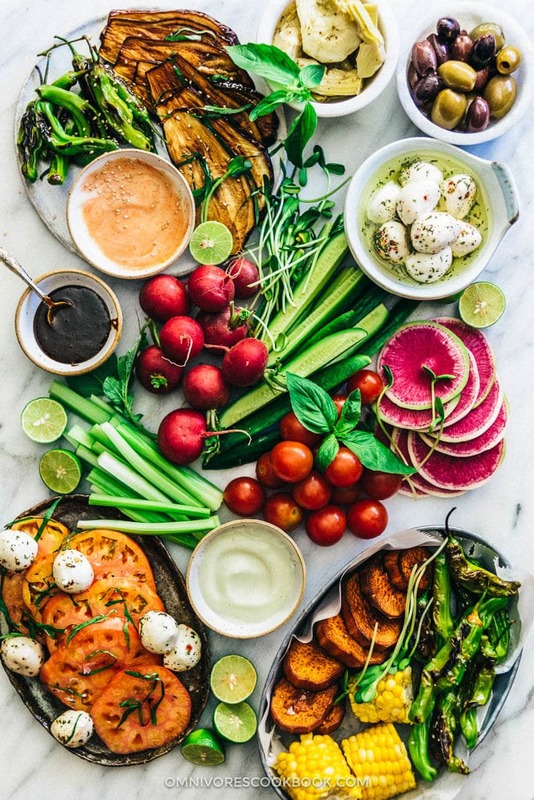 This recipe is designed provide inspirations on how to make a delicious crudité platter, so please feel free to tweak it with your favorite vegetables. You can skip the cheese from this recipe to make it vegan. Place corn on the cob into a large pot and add water to cover. Cook over high heat until brought to a simmer. Cover, turn to low heat, cook for 10 minutes. Transfer the corns onto a plate until cooled. Divide into small chunks for serving. Place baby eggplant into a big bowl and add water to cover. Add salt and mix by hand. Place a plate on the eggplant and allow to soak for 20 to 30 minutes. Meanwhile, prepare other ingredients. Add 2 inches oil to a small deep pot (8 to 9-inch) and heat over medium-high heat until it reaches 375 degrees F (190 C). If you do not have a thermometer, dip a wooden chopstick into the oil. You should see small bubbles sizzle around the chopsticks. Fry sweet potato until the surface turns golden brown, 2 to 3 minutes per side. Transfer to a plate with a few layers of paper towels on top to drain the extra oil. Drain eggplant and pat dry thoroughly with paper towels. Dust both sides with cornstarch. Deep-fry in the same pot until the surface turns golden, 2 to 3 minutes per side. Transfer to a plate with a few layers paper towels on top to drain extra oil. Heat up a heavy-duty skillet with 1 tablespoon oil over medium-high heat until hot. Spread shishito peppers without overlapping. Cook over medium heat until blistered on both sides. Transfer to a plate. 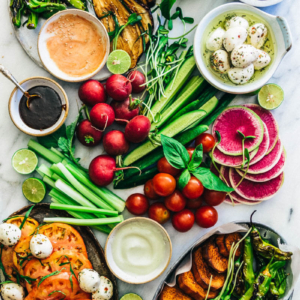 Arrange all the vegetables on the platter, fresh veggies in the center, cooked veggies on the side, and the dipping sauce. Use this vegan mayonnaise recipe if you want to make a vegan version. I LOVE the way you did this platter Maggie! So gorgeous and perfect for a veggie party!! Wow! What an ultimate guide! Stunning photos. 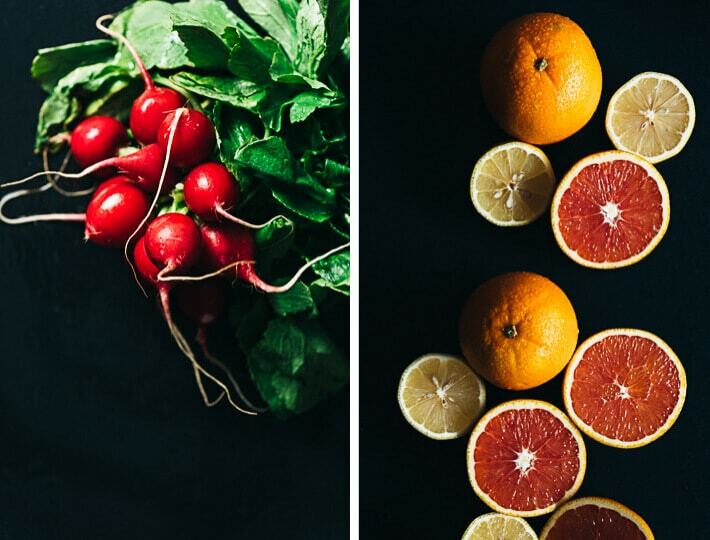 Fresh ingredients always looks so attractive. I’ve seen many beautiful vegetable platters while living in Switzerland. Culinary influences from three nearby countries (French, Italian & German) make Swiss food culture very interesting. Very attractive and such an appealing variety of ingredients and dips (love the dips). 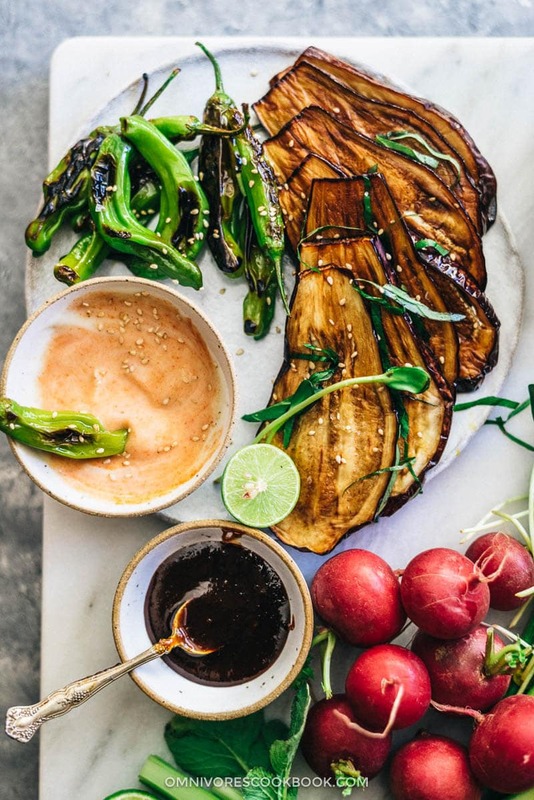 I like that there are different textures, from roasted and blistered veggies (shishitos and eggplant are personal favorites) to crisp fresh or pickled ones.